It was on the morning of our third and final day that my guide said, "If it's alright with you I'd like to try out some new roads today." I was game. A new road had been built in the mountains near Mai Chau that connected some previously inaccessible villages. "New" is stretching it - "unfinished" is more like it. But if you give it enough gas, those Minsks can make it over just about anything. The younger kids stared in wonder as we drove by. The guide rode in front and broke the ice, and by the time I rode by the older kids had run out to wave and shout. "I doubt there's ever been any tourists up here," he told me as we stopped for some photos. Two days earlier, the trip had begun in a construction lot outside Hanoi. 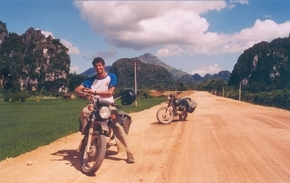 I had never really ridden a motorbike before, and so I was getting the basics before hitting the road. I got a bit frustrated. But the guide was patient, and before long we agreed I was road-ready and we headed out. Surprisingly to me, by midday I was comfortable on the bike, just in time to enjoy the incredible scenery that had gradually emerged. Jungle covered Karst rose up all around us. There had just been strong rains, and the rice paddies were greener than any land I had ever seen. We made some stops, for lunch and bia hoi (local brew), and chatted with the locals. The last stretch of the day was a winding, rolling jungle road through Cuc Phuong National Park. I felt like I could have ridden that road for days. Pure joy. Around midday we came suddenly to a 50ft wide river complete with rocky rapids. The road started back up on the other side as if it went straight across underwater. I looked at my guide. "Well," he said, "There used to be a bridge here." A flash flood had taken out the stick bridge the week before. A pair of industrious young locals had strapped together a bamboo raft and were gouging us for 25 times what the fare had been to get across the bridge. This was one time the term "all inclusive" came in handy for me. On the other side of the pass we rode through little towns that backpackers would no doubt throng were they ever found by the Lonely Planet. The last leg of the day we descended into the valley of Mai Chau along a windy road hugging the mountain, looking down at the paddies and villages below. Something about following the curves in the road, the soft early evening light, knowing we had earned the views of the valley, the word 'sublime' came to mind, and I thought that these had been the best two days of my five week Southeast Asia trip. Riding into the village felt like riding into the Shire. Clever channels and water wheels carved into the hills regulated the water in the paddies, small clusters of stilt houses, all nestled in the bowl of mountains on every side. We stayed in one of the stilt houses, friends of my guide. He had been invited to a family wedding in the fall, and we talked with them about the plans and the customs. More great food, another bottle of local brew, more good talk and deep earned sleep. That next and last day, after the 'new' road had taken us up in the mountains for a breathtaking view of the Halong-esque reservoir below, it winded down to meet the water. We came to an earthen pier where a weekly market was just ending, and we hired one of the leaving boats to take us back to the main road. The only way down to the pier was by four flights of stairs, and a few of the market-goers helped us ease our bikes down. The Karst and calm roads slowly gave way to the rush of Hanoi traffic for the final approach. I had been quite anxious about that final ride through the crazy streets of the city, and it happened that we arrived at the height of rush hour. I had gotten in quite the groove over those three days though, and shadowing my guide through the traffic was actually great fun; I was taking part in the city instead of just watching it. I felt much more at home in Hanoi after doing it. When we arrived at my hotel, I had a hard time saying goodbye to the bike, my guide and the trip. He called ahead to Sapa to arrange a hotel for me and took me to get my ticket for that night's train. He told me about the roads out there and how to bike them. After our trip, I didn't have to be glued to the very popular tour companies. I rented a Minsk and saw Sapa the way I wanted. I discovered a great new way to travel. To really be part of the country. Thanks for a fantastic adventure.